On Sunday I was prepping the second one to take out on my journeys for Monday and realized I not only cut off the ankle portion of the first sock way earlier than I needed to, I also made the meanest, snuggest heel flap and gusset you can imagine. Now that I know I have yarn to spare, I feel like I should rip them both back to the cuff and adjust accordingly. On the other hand... really? Rip them out?? It's not like I don't have a zillion other things to finish. 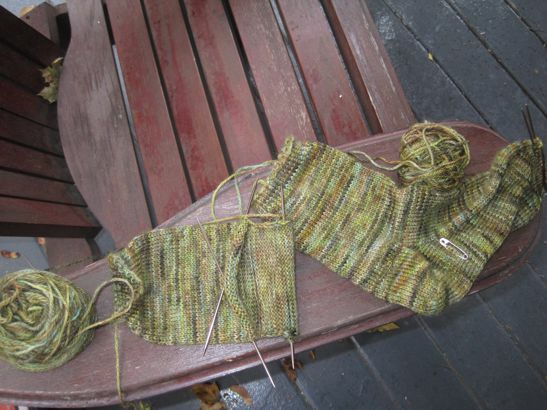 And the mostly-finished one does fit fine in spite of the gusset issue. It could maybe - maybe - use one more stitch at the top of my foot where the sock bends, but there is plenty of flex and my foot is quite comfortable in there. Still. Favourite colours! and it matches my green cardi so perfectly, I know I'll want to wear them a lot this winter, and they are just a bit short to sit up over my leggings. Will I enjoy them if my leg is always freezing for an inch above the cutoff? No no, this way lies the crazy. I have three more pairs of these socks to make (admittedly in very different colours) and I can make them all much longer with a slightly fuller gusset. Maybe I can even knit a separate cuff-ish legwarmer to slip in under these particular socks. Out of a felted wool sweater sleeve, maybe? I did take the second sock with me yesterday and as I knit I thought how nice the leftover yarn would be in a nice pair of Fair Isle mittens. So the socks are safe another day... but I have a terrible feeling I might change my mind again and rip them to fend off any further mental discussion on the point. Knitting: so much not just a mindless, relaxing activity.